I have a doe, Patsy, that is very "difficult" this is why her nickname is the DEMON. She refuses my buck, bites him, growls at him, hates me, which makes things worse come breeding time. I have bred her 5 times, the first 2 unsuccessful, the 3rd breeding she had 5 kits (they lived 3 days then all died). I just assumed that none survived because of her inexperience anyway.... 4th breeding nothing.... now we are at her 5th breeding and now 30 days in she SEEMS heavily pregnant. Patsy did not make a nest for her first litter and I'm just worried for her hopefully future kits. Thanks to your helpful site I know what to look for. I can't properly palpate just yet so I don't know if she is pregnant. Her fur is loosened and I have been pulling out small clumps and putting in the nest box, maybe she will get the idea. Right now she hasn't used it for anything other than a hay buffet and litter box. Should I cull, sell, or give her more chances if she doesn't keep this litter alive. If the litter is alive when born, if born, should I try hand feeding since all my other does do not have litters? Hand-feeding = goats milk with egg yolk or kitten milk replacer? I have heard both negative and positive reviews. Thanks ahead of time for any extra help! Do "demon" rabbits really need to breed? I'll be interested in learning how it goes for you, Sarah, but I'll tell you how it'd go if this were my doe. Three strikes, and she would have landed in the soup pot. Difficult does don't last in my barn. Why would I perpetuate a possible genetic propensity toward aggression and failure to mother, when I can breed any number of sweet does, who will successfully kindle and raise all their litters on the first try? But, yours is a "demon" rabbit.... Why keep her? It's a valid question which I can't answer for you, but which might give you food for thought. I would first want to know how old your doe was when you started breeding her. My Jane almost got thrown out into the field to fend for herself by me when she was about 6-7 months old. She attacked me fiercely, over and over again! When she had her first litter (9 months - a bit young), I was clueless. She took the kits though, and all 6 lived. I grabbed Fred out and castrated him. He had gotten Jane anyhow. 32 days later, she had a second litter (4 kits, all of whom lived). With both litters, I was allowed to handle the kits from about 2 weeks old. She was still a bit difficult at times after that. Whenever she was scared, she would bite. Sometimes drawing blood on my lips, my hands, etc. If she felt safe, she was the most loving creature in the world. She remained something of a biter. Neither of her daughters that I kept liked to be held a great deal, until they were about 5 years old. Both boys were VERY tame! They were little love-whores. They let anyone love and pet them. Jane died of lung problems on Oct 3, 2015 at 6 1/2 years old. She was my sweetheart. She gave me 4 gorgeous babies. My rabbits are pets, though. I'm wondering if this sort of behavior isn't more learned than genetic, in many cases. It may also just be instinctive, like in Jane's case. Also, some does do settle down once they've become a mother. If they become a mother too young, they will not take a litter on. It may be the same case if they're too old. As was alluded to here, does she have to be bred? I wouldn't put her in a cook pot. "Muss man aber selber wissen" (one must know for oneself what to do). I hope you are right. She seems to be going through stages of being her old sweet self (hopping up to the cage door and resting her chin on the opening to be pet, and the other self of growling and biting. I believe she was a good mom with the other babies. They were fully furred which makes me think they were several weeks old when they died. Unfortunately, I believe I am the cause for them to have died. I did not know of the babies when I removed the rabbit from the hutch and brought her inside. I just believed that she was skinny due to my children neglecting her. Because our winters can be quite harsh, I thought she would freeze to death outside, so I brought her in. Later when I would go out to check on our other buns, I saw burrow holes in the straw, but assumed the mice had moved in. We have a very aggressive doe as well. She was purchased simply for my son's 4H project. It didn't take him long to abandon her as his project. We kept her around because I wasn't sure what to do with her. (She is an exotic breed, not big enough for meat). Anyway long story shorter, this past winter I went out to the lean-to (where our hutches are) and noticed she was extremely skinny. I brought her inside thinking the kids were not feeding her. She was still extremely aggressive: lunging at me, growling at me, biting, scratching, etc. After she had been inside and we fed her all sorts of goodies, she became the sweet Sara we thought she would be. When spring came, I went to clean out her hutch and found (dead) babies buried in the straw. Earlier, we had had her in a dual hutch where we kept our buck on one side, and her on the other. There was a big enough gap between the roof and the separating fencing that she hopped over to be with the buck. I had moved her out of that hutch into our other one, and frequently checked her but didn't think she had gotten pregnant. I had been counseled by others that she may be depressed due to loosing her babies, so we attempted to breed her again this past weekend. She is back to being Satan. If she is not pregnant, I am not going to try again. Interesting, thanks for sharing. Rather than being depressed, I'm guessing the doe is feeling maternal hormones. Some does just get excessively protective of their space when pregnant and lactating. If so, then her aggressiveness is a sign of pregnancy. Chances are good that she will be mean and aggressive toward you until her babies are nearly weaned. I hope she takes care of them this time! Even so, she should never be allowed to bite. You'll have to strike a balance between keeping her fed and her cage clean, and leaving her alone. 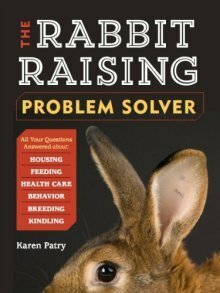 Rabbit Raising Problem Solver has some excellent Q&A's on the topic of aggressive/pregnant does. If you are in the rabbit business to raise rabbits to sell, you must make a plan. Does Patsy meet or exceed the plan? Injury to your buck and no off-spring, as well as ill tempered toward you would seem to disqualify her for pet or business purpose. She is occupying valuable real estate and needs to be replaced with a doe that meets your plan. Whether you sell, give away or harvest is your decision.